With one-third of its programming day– eight hours out of 24– devoted to original local news content, WAGA made a remarkable decision last year: Do more. So it added a half-hour at 11pm, and decided to call it “Fox 5 News Edge.” It competes against the 11pm broadcasts of the other three Atlanta stations. It also competes against its own 10pm news, and not always favorably. Consider Wednesday. WAGA’s desk sent Julia Harding to cover an incident billed as a home invasion in Marietta. When Harding got on scene, she learned that police didn’t know if a) anything had been taken or b) anyone had been hurt. There were no victims around; only a neighbor who spoke on-camera about how distressing it was to have– whatever it was– happen in her neighborhood. In all likelihood, Harding told her betters that it wasn’t much of a story. In all likelihood, Harding was told to make it a lead. As a result, Fox 5 News Edge led Wednesday’s newscast with the thinnest of gruel. The Edge looked more like a precipice. WAGA certainly employs some predictable tricks to give this show an edgy taste that one might compare to a “woo-hoo!” shot of Jager in a crowded college bar. There’s a whoosh sound effect that’s employed liberally between anchor copy and sound bites. There seems to be a dizzying emphasis on crime and disaster stories. And there’s the syrupy flavor of some snappy-sounding yet cliche-laden writing, led Wednesday by an anchor package on Scott McClellan’s book that’s “sending shock waves through Washington” and has “Democrats… foaming at the mouth.” The Edge has the loopy, lowered inhibitions of a tabloid newscast. And then there’s Tom Haynes, the broadcast’s anchor. Haynes stays on his feet through the half-hour, tossing to live shots, erupting in a “boy, look at that!” when he sees some tornado damage, adding a solemn “terrifying stuff” after a victim describes her experience. Haynes may be Atlanta’s slickest male anchor, with made-to-order telegeneity and quickness. He may also be the most heavily powdered, the hue of which sometimes seems to too-closely match the faux wood veneer of the news set behind him. The same night, WAGA’s 10pm news led with a somewhat-compelling a-block story on a police crackdown in a crime-ridden neighborhood. The a-block rounded out with stories on a sheriff’s candidate forum; and a piece of surveillance tape that may show the image of a still-at-large killer. If there was an internal tug-of-war between the producers of WAGA’s 10 and the 11 o’clock shows for the best material, the Edge lost on this particular night. Best moment: Sports guy Ken Rodriguez’s tease about the Braves loss. “Sports on the edge is really cranky tonight!” he growled, employing no sound effects. This entry was posted in WAGA on May 29, 2008 by live apt fire. Q: Are you trying to get back into TV news? Coz you’ve got a funny way of showing it. A: My exit in 2007 was final. I overstayed by five years or so. The answer is absolutely not. Q: So now you’re God’s gift to TV news, sitting on the sidelines? A: My on-air skills were middling at best. My competitive fire was never hot enough. But I know newsgathering and story production. Everybody has an opinion. I just happen to have a blog. You can get one too. Q: Is anybody reading it? A: It’s had, what 30,000 hits? I don’t know if that’s a lot or not. There’s an ongoing tally to the right. Q: Do you spend all day watching the news now? If so, that makes you pathetic. A: I watch as little as possible. Mostly, I hit “delete” on entire newscasts on the DVR before I even view them. The other times, I’m hitting fast forward. I watch until I find something to write about. I devote about an hour a day to watching and writing. Another blogger with more patience could write a much more comprehensive column. A: Mostly, to raise the SEO profile of my business web site. Secondarily, because TV news deserves the scrutiny. The folks who run it are rarely called on their BS, except whispered behind their backs. I see myself speaking on behalf of the newsgathering crews who like their jobs too much to state the obvious out loud. Q: Any posts you regret? A: Before I had any readers, I wrote a harsh post about Monica Pearson. Whenever our paths crossed, she was always the gracious diva. I should have been less bitchy. Frankly, when I was in the news biz, I didn’t watch WSB much. The more I watch her, the more I respect her talent. But Jovita is more than ready to take over. A: For some reason, these two stand out. I gotta admit, it’s fun to clobber WGCL. And my views spike whenever I write about 46. I think the staff there gets a kick out of reading how silly their bosses are. Conversely, my views drop whenever I clobber WXIA. That’s how boring that station is. (One exception: This is one of my most-viewed posts ever.) Note: WGCL and WXIA changed their news management after this was posted. Q: Why so easy on WAGA? A: I clobber them too. But they’re the most enterprising station in town, and have the fewest on-air fools. WSB competes well because it has more muscle, a higher payroll and better technology. Q: Do you ever reject comments from readers? A: I’ve tossed some highly personal “what a pathetic egomaniac (blank) is” kind of stuff. But hardly any comments get rejected. I’ve even allowed some nasty stuff written about me. Why, I don’t know, except that it indicates the mind-set of some of LAF’s readers. Q: Why haven’t you written more about the morning shows? A: Can’t bring myself to watch them. Someday, perhaps. Q: Why don’t you post pictures? Q: Why not branch into other commentary like other bloggers? A: This book is really fun to read. This band changed my life. A newspaper needs to hire this kid. That kind of stuff? Q: Maybe nobody cares what you think about that kind of stuff. Q: Why the first-person plural? Isn’t there only one of you? Q: Why so hard on WGCL and WXIA? A: WGCL is just goofy, but at least they’re trying. WXIA has an amazing staff, yet coasts. Q: Couldn’t you do an entire blog just on Mark Winne? A: Yes. But would anybody read it? Q: Isn’t it time to eliminate “wordpress” from the domain name? A: I’ve bought liveapartmentfire.com. I just haven’t done the clicks to make the conversion yet. I have a business to run and news programs to delete. Q: Are you on hiatus now? Because you haven’t actually posted anything about the news in several days. A: Yes, but not for long. This entry was posted in Uncategorized on May 27, 2008 by live apt fire. You’ve seen those brightly painted local television live trucks. The graphics are so fantastic. And there just might be (gasp!) a news personality inside! Is that the handsome Steve Day! No, O’migosh it’s the lovely Amanda Wi! And then three seconds later. . .REALITY CHECK. Wow. I almost hit that TV truck. Live trucks are incredibly dangerous even when parked; but they’re even more dangerous in that scenario. The live truck’s anatomy itself is dangerous. The mast – the telescoping antennae on top of the truck – makes the truck top heavy. Additionally, the equipment-laden truck is very difficult to stop once it gets going. 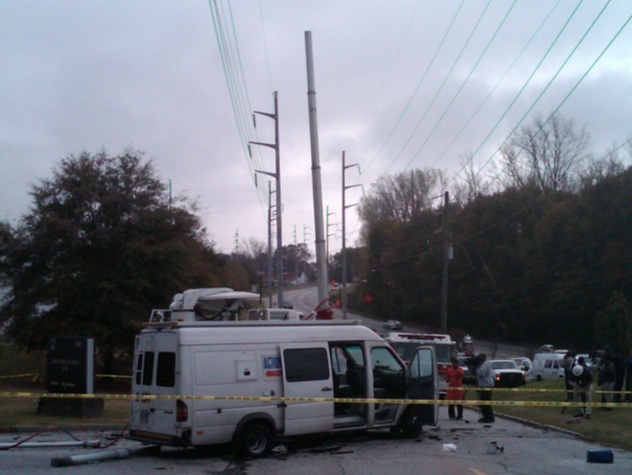 Read on to get the inside scoop about why you ought to stay away from TV live trucks! The person in charge of maintaining a television station’s fleet is called the fleet manager– usually a powerless employee who must wear many hats. Because a television station is its own corporate bureaucracy, with bottom line obsessed bean counters in far away places, the fleet manager may have to wait for written permission to purchase a part or service. Repairs that are deemed non-essential may be delayed. Need new side view mirrors? The cracked ones are still OK. You say the trucks reverse and backing up alarm is down? Forget it. Brakes? Tomorrow. There are, however, even greater challenges for the keenest of fleet managers. Many live trucks are driven around the clock. A photographer starts a shift at 9AM and drives the live truck for eight to ten hours. Then a night crew takes over the truck. The same truck may stay in use for the overnight shift. 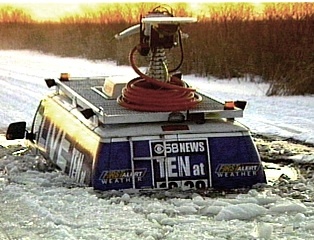 News crews are necessarily rough on live trucks, because news events by their nature are difficult places to negotiate. Live trucks have to be parked in tight places, wacky inclines, stony fields, curbs, crumbled concrete– treacherous places where no “normal” motorist would ever go. That means that a live truck is in continuous need of repair and alignment. Furthermore, the news crew themselves, though innocent in my view, are also a danger. Their thankless task masters incessantly call both the photographer and the reporter on their personal and company-issued cell phones and Blackberries, mercilessly urging the crew to hurry to breaking news, reminding them that competitors are already on the air, LIVE! with the story. After one call ends, another instantly begins as yet another person in the same office, from an adjacent cubicle, barks out the same questions: “WHERE ARE YOU NOW! NO, RIGHT NOW! I WANT TO KNOW WHERE YOU ARE RIGHT NOW! WELL WHEN CAN YOU GO LIVE!?! Never mind that these reporters and photographers just had the same conversation with three other people seated four feet apart back at the television station. In a live truck there are potentially four cellular telephone conversations going on at the same time as news crews handle their addled managers, the engineering department, those portions of John Q. Public – witnesses and survivors – directly affected by the news event, and the first responders’ public information officers, already at the news event. Let’s say it together with passion: !DISTRACTED DRIVERS! Finally, the fair reader must know the truth about the occupants of the live truck, and about their employer. Because the aforementioned bean counters know that it is cheaper to make existing employees work overtime than it is to employ enough people to do the actual work, that news crew may be working a 14 hour, break-free day, using only coffee and cigarettes for sustenance. Be assured the driver of a local television news live truck is pulling a gruesome 50-60 hour work week, made up of a muesli of overnight shifts, doubles, split shifts, and turn-arounds. Indeed, the wretched souls who operate live trucks for local TV stations may be seeing double, and hanging on to consciousness like a loose tooth. In summary, motorists should resist trying to get close enough to a local television live truck to recognize the people inside. The live truck anatomy is dangerous. The live truck may not be well-maintained. Of most concern is the human issue. More likely than not, the operators of these live trucks are exhausted, highly distracted drivers who are in a much different place that you could ever, or would ever, want to be. Race Bannon is a pseudonym for a current employee of an Atlanta TV station. LAF welcomes submissions. We don’t have to publish your name, but we have to know who you are. Get our contact info from the “contact LAF” page. This entry was posted in bannon race on May 22, 2008 by live apt fire. WGCL actually leading its 11pm news with two storm damage pieces instead of an “only on CBS 46” exclusive. WXIA’s Brenda Wood, beginning WATL’s 10pm newscast by saying “…due to downed power lines and a lot of damage, it’s been tough getting (our) reports in. We’re going to do the best we can.” WXIA spent the next thirty minutes looping the same 35 seconds of storm damage video. WXIA’s Ted Hall, live in Cherokee County: “It might sound kind of trite but it really did seem like something out of a disaster movie pulling in here.” Hall and Julie Wolfe’s shared live shot had a poor signal and had a very Kirk-in-the-transporter quality to it. This entry was posted in Uncategorized on May 21, 2008 by live apt fire. Some cliches will never die. “If it bleeds, it leads” is one of them, a cute catch-phrase grasped by smirking detractors of TV news. Like many cliches, it’s an oversimplification. It’s a stereotype. It’s tiresome. But it also hints at a larger truth. TV chases breaking news. It doesn’t have to “bleed,” though. It can be stuff as mundane as a gas leak, a water-main break, a traffic tie-up. What’s more insidious is TV’s obsession with breaking “news” that is barely news at all. A “suspicious package” at a post office? A bomb threat at the Capitol? Get it on TV before the other station does. 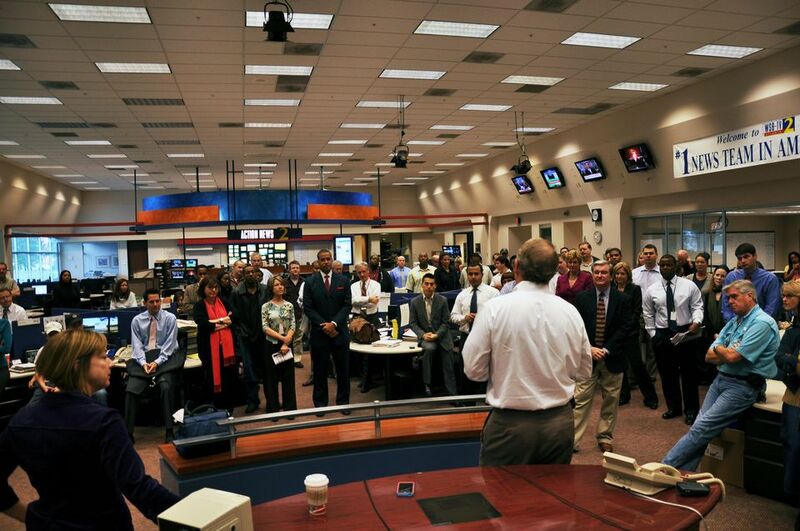 Monday was significant for this reason: On WSB’s 6pm news, nothing bled in the A-block. There was no “breaking news,” real or imagined. Every story was worthy of the front page of the metro section of any respectable newspaper. An exclusive on a judge jailing a motorist for violating the HOV lane (see below). Coverage of a sheriff candidate’s last-minute qualification to get on the ballot. A cop arrested for DUI whose supervisor apparently requested special treatment for him. The Atlanta city council’s override of three mayoral vetoes. There was some traditional death-and-destruction in some of the other stations’ newscasts– anchor v/o’s on a trench collapse, a smash & grab, a school bus accident. But WAGA led with an exclusive on some squirrelly unauthorized spending at city hall. WXIA led with the mayoral overrides. No doubt, there were newsroom personnel complaining that Monday was a “slow” news day. But TV is at its best when the “breaking news” goes on hiatus, and its reasonably-well-paid news staffs develop newspaper-worthy stories. This entry was posted in WAGA, WSB, WXIA on May 20, 2008 by live apt fire.